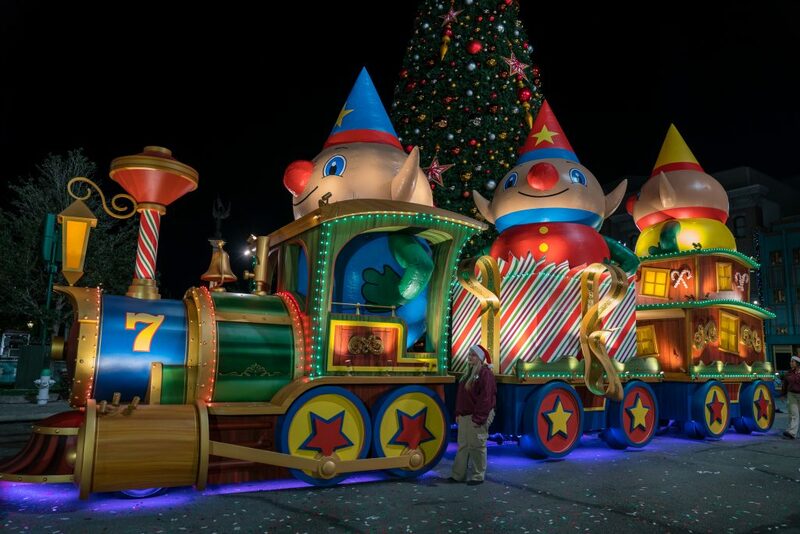 At one time called the Macy’s Holiday Parade, the holiday event was last year rebranded as Universal’s Holiday Parade Featuring Macy’s and has been given a somewhat bigger scope: although the famous larger-than-life Macy holiday balloons are still part of the proceedings (and, in fact, included 16 new entries for 2017, with 13 of them being designed exclusively for Universal by the storied company), they are now joined by 15 new “incredibly detailed” floats that include “astonishing” lighting displays and that feature the likes of the Minions, Shrek, Madagascar‘s cast, and, of course, Santa Claus himself. Oh, yeah – there are also over 100 individuals manning those floats as characters or walking between them as dancers. 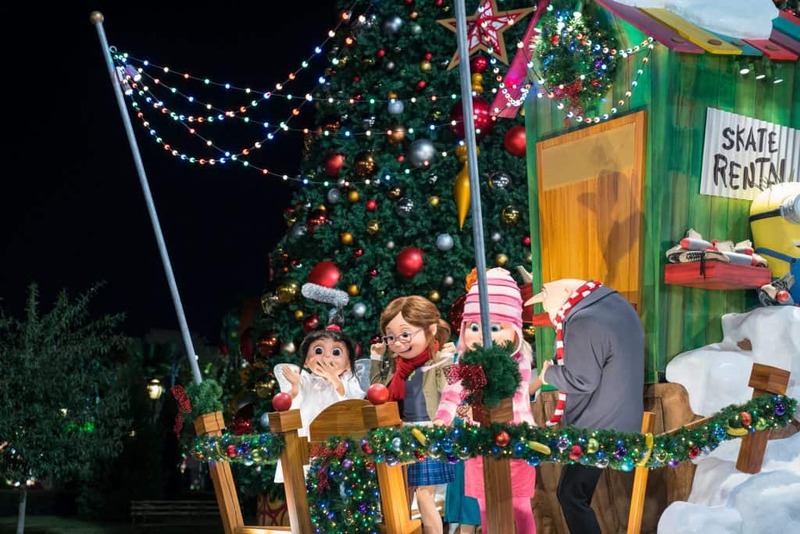 When combined with the tree-lighting ceremony that’s presided over by Santa, it makes for a major, magical experience. Though not confirmed yet by Universal, it looks like that 2018’s parade lineup will remain mostly – if not exactly – the same as 2017’s. 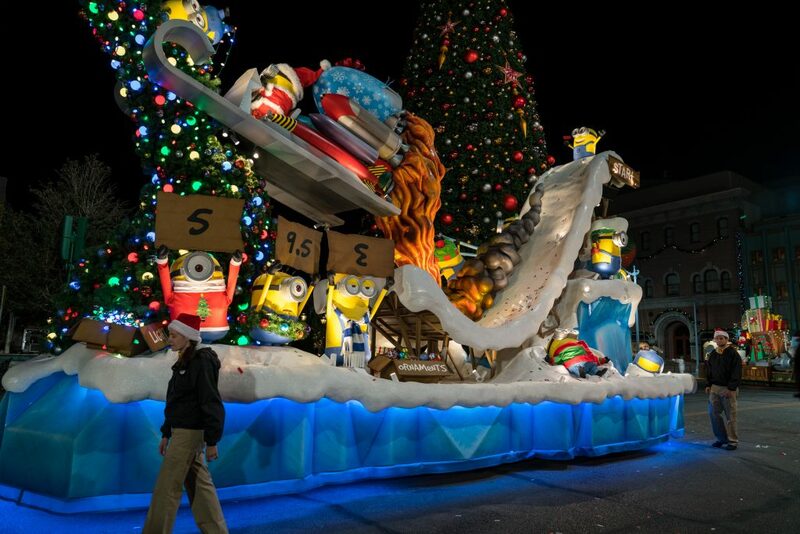 Let’s take each section of the Holiday Parade one by one, shall we? 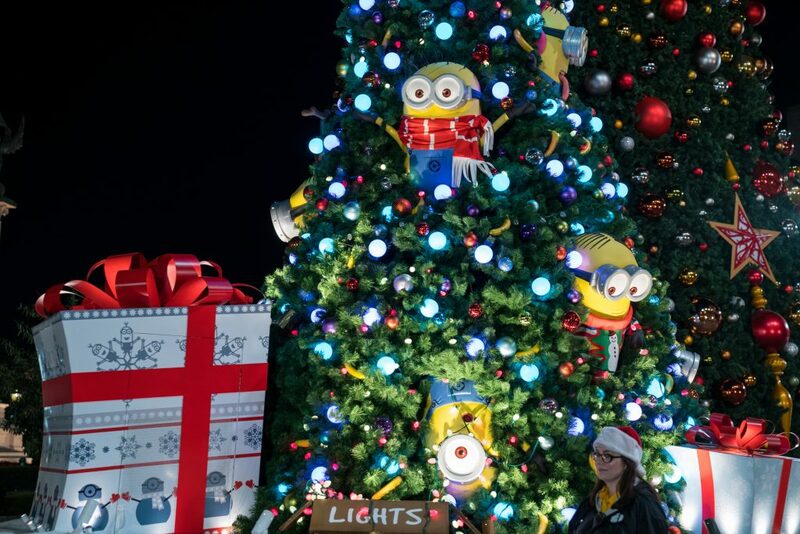 The Minions crawl all over a giant Christmas tree on their first float, attempting to decorate it while singing their very own version of “Jingle Bells.” Gru, Lucy (making her theme-park debut), and the girls are right behind them, decked out in their holiday best and wishing all a Merry Christmas. The cast of Madagascar has taken over the biggest collection of the parade floats, where they’re throwing a tropical holiday party. 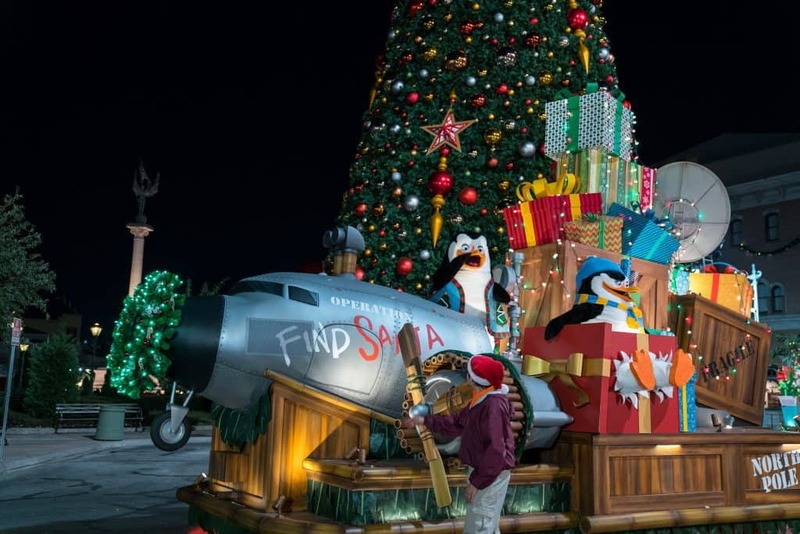 Expect to see hi-jinks all around: King Julien presides over a giant pineapple balloon, the Penguins are on the hunt for Santa, and Alex the Lion, Gloria the Hippo, and Melman the Giraffe are doing… well, their own thing, like usual. 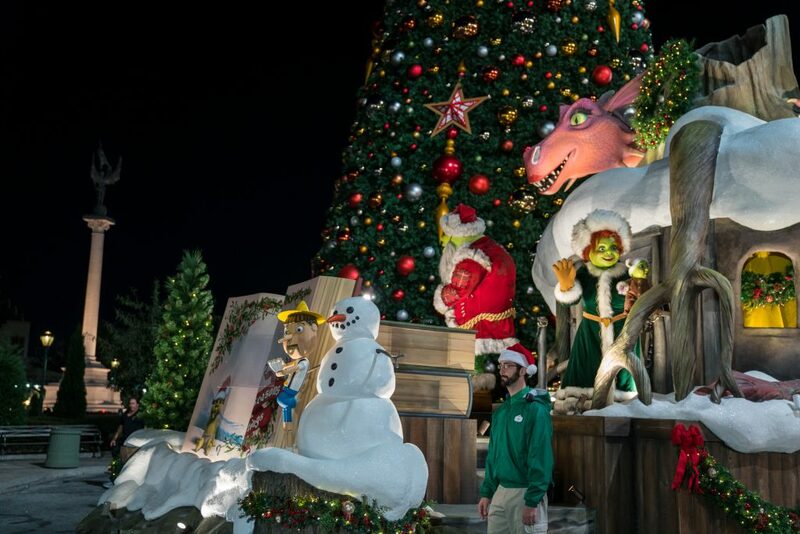 Shrek is next up, accompanied by his wife, Fiona, their ogre babies (who are also appearing in the theme park for the very first time), and, of course, Dragon and her dronkey babies. 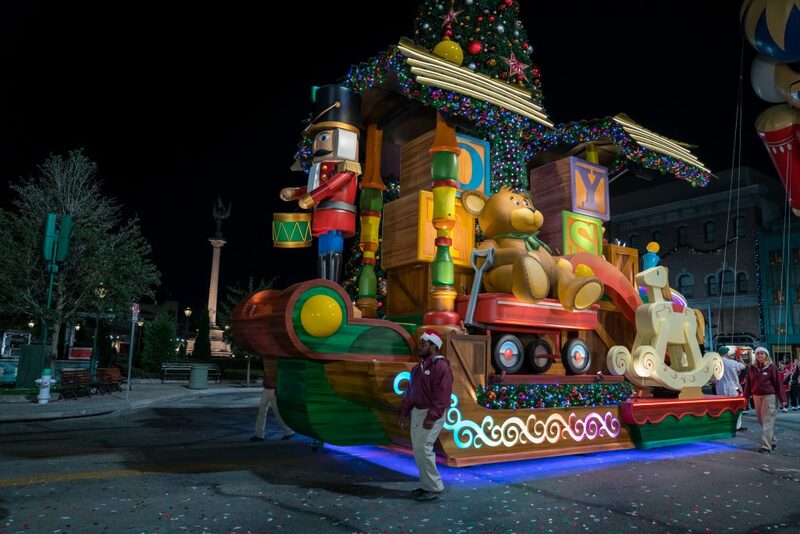 But don’t think that the Holiday Parade is exclusively comprised of animated characters – the final two units of the procession include toys (featuring such classics as Raggedy Ann and Andy) and, last but not least, Santa Claus, who rides in on his grand sleigh to light Universal Studios Florida‘s giant Christmas tree. 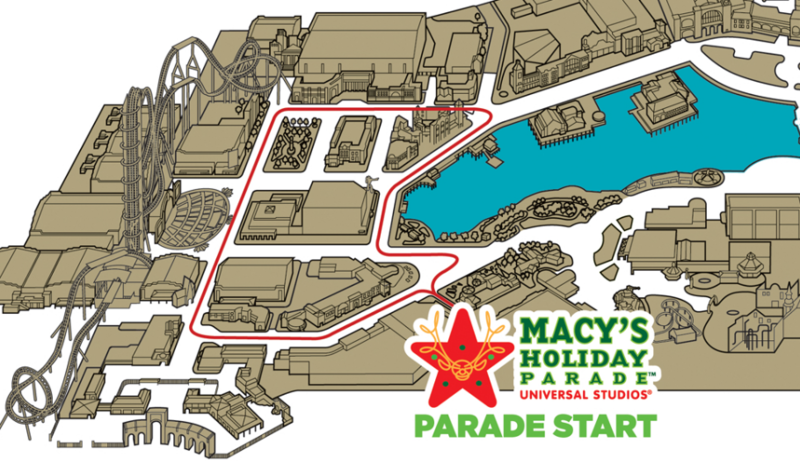 Universal’s Holiday Parade Featuring Macy’s runs every day of the Holidays event, which goes from Saturday, November 17, 2018 through Sunday, January 6, 2019. Please note, however, that the times do change across this date span. 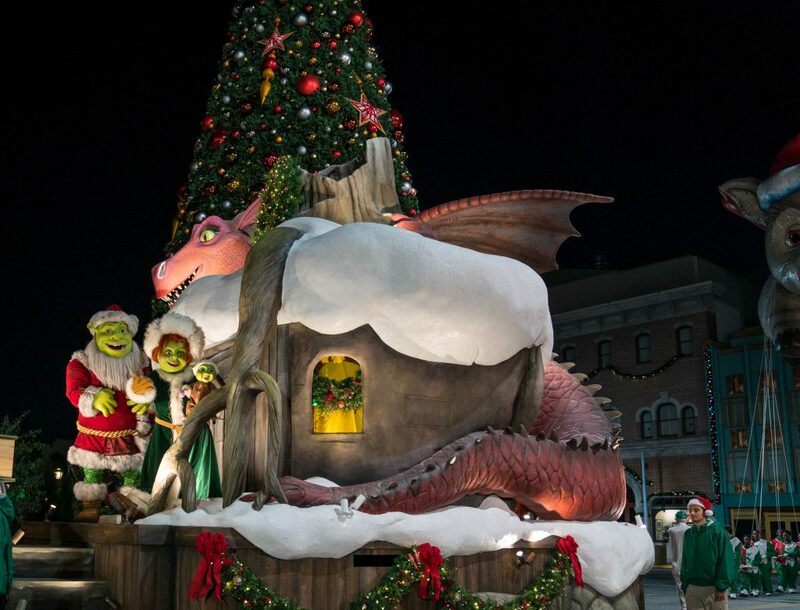 Universal has an exclusive, limited-time, holiday-themed viewing area and dessert party available for its newest parade. 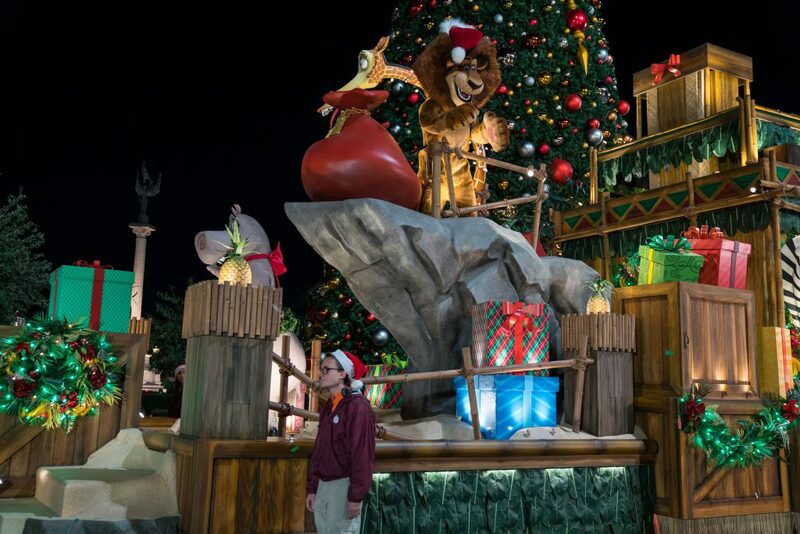 While this upcharge experience, which includes an assortment of beverages (such as coffee and hot chocolate), is only available from December 24 through December 30, 2018, we’re still making mention of it here – one never knows when the company will trot it back out for another limited engagement. You can read all about the premium add-on in our Holidays guide. 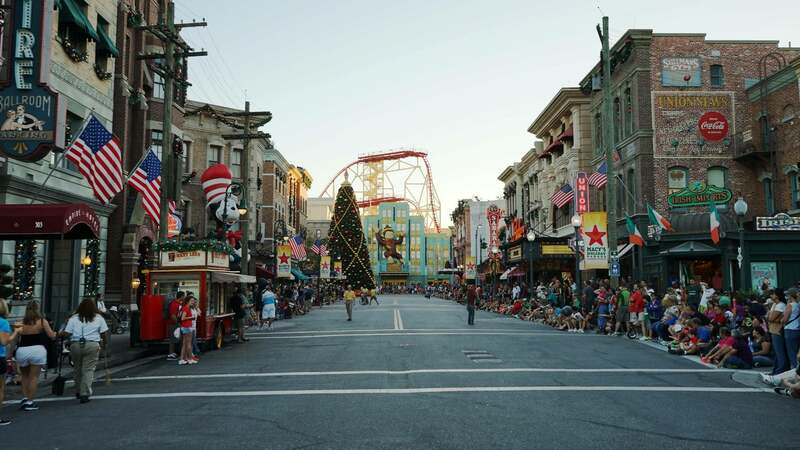 Universal’s Holiday Parade 2018 – what’s the best place to watch the parade? 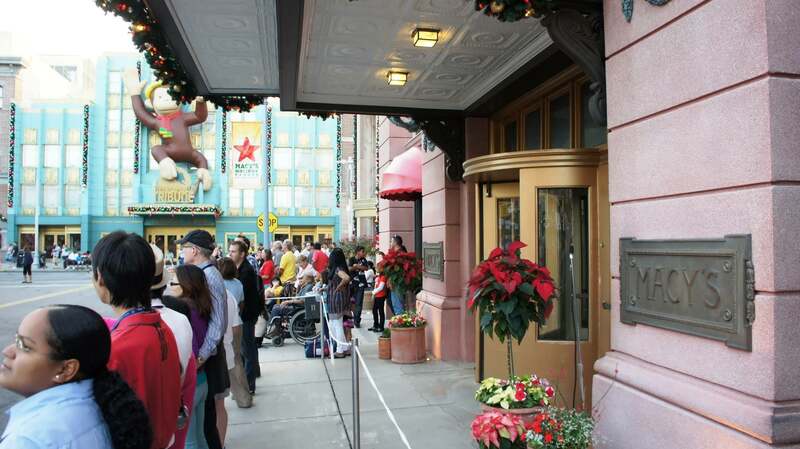 Some of the space here may be roped off for VIP viewing, but that’s no matter – just try to find a spot in front of Macy’s or Mummy. Why is this the best place? 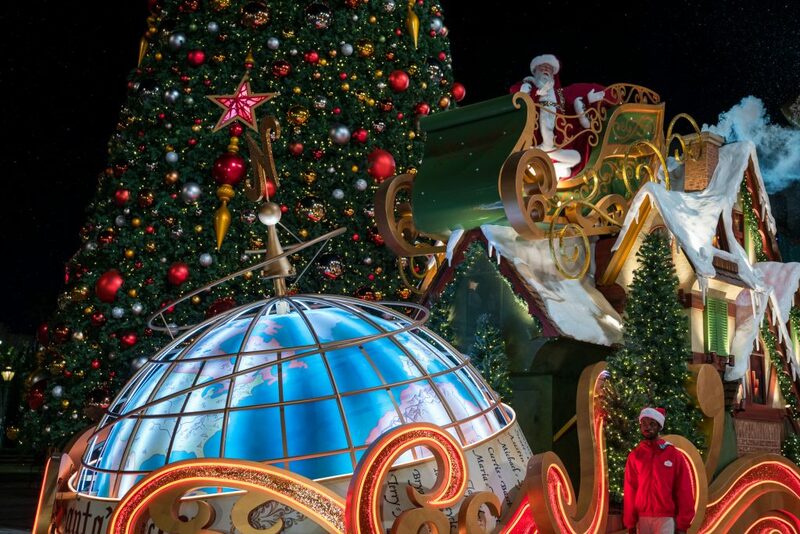 Because not only do you get to watch the whole parade as usual, but you’ll also get a special treat: at the end of the procession, Santa stops in front of the beautiful Christmas tree and hosts a lighting ceremony. As you might imagine, the area near the Macy’s building is also one of the most crowded places to be. 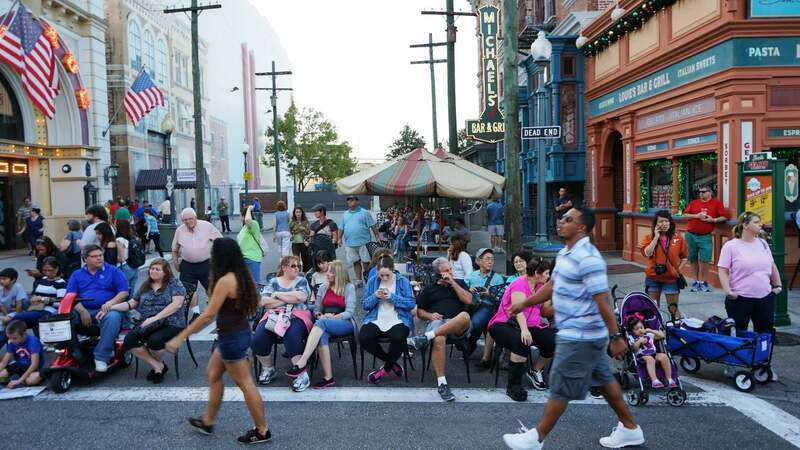 If you want to avoid the throngs of people, then choose a comfortable location anywhere in the Hollywood backlot (near the Universal Studios Florida park entrance). 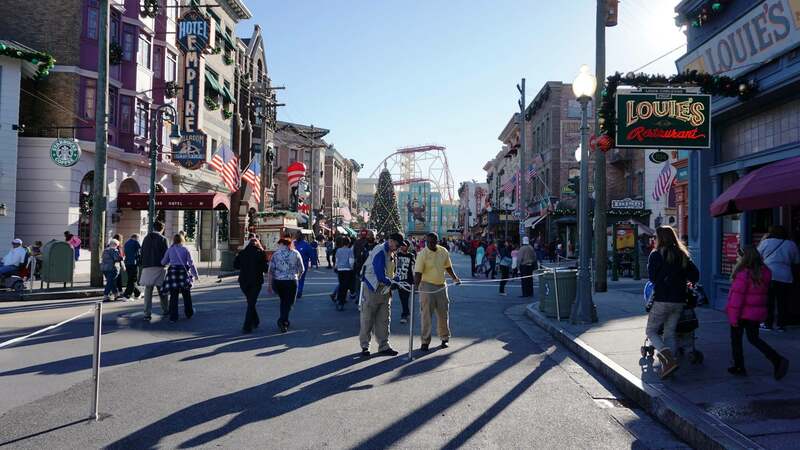 This area is not only less crowded, but if you plan on leaving after the Holiday Parade, you will be able to get out before the majority of the parade-watchers start to leave. Is the area in front of Macy’s too busy? Well, we have another great spot for viewing the parade and taking photos. Our second recommendation is in front of Louie’s Italian Restaurant, literally just down the street from the Macy’s building. Here, the parade turns to head back to where it started, giving you a perfect opportunity to shoot “head on” photos with the New York facades as a backdrop. This will make your images more reminiscent of the Macy’s Thanksgiving Parade in New York City as it winds through the city streets. Look for the metal gates or ropes used to mark the parade’s turning point, as you see in the first photo below. Plant yourself there about 25 minutes before the parade is scheduled to start, and you should be set. Keep in mind that you will be waiting a bit, because you have to wait the 25 minutes until the parade starts, then you have to wait for it to actually move through the Hollywood and Production Central sections to get to your spot in New York. 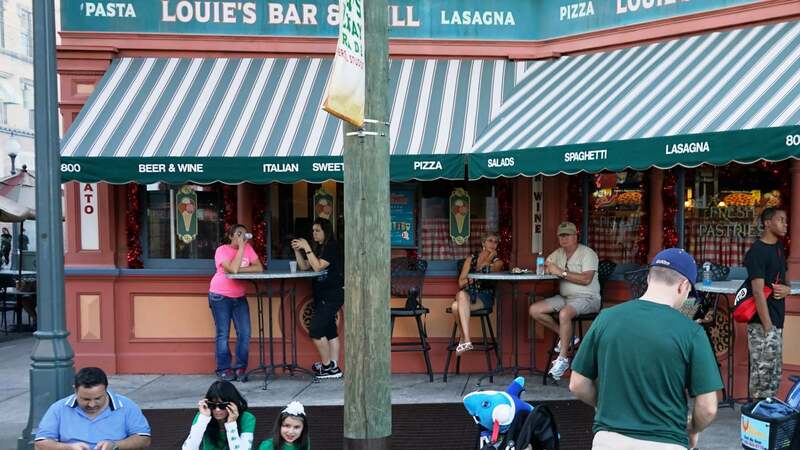 But don’t fret – there’s a beverage stand right in front of Louie’s that sells a few snacks, soda, and beer. And the restaurant itself should also be open. Once the parade is over, from here you should still be able to rush back over to the Christmas tree if you’d like to participate in a few photo ops. Other seating locations include the half-a-dozen benches in Hollywood. Universal annual passholders get their own private viewing spot, which last year was located in front of Mel’s Drive-In. However, for the reasons we explained in the previous section, we’d recommend that passholders skip this private spot and head for New York.